The Yankees will open up their season Thursday at home and their 25-man roster is unofficially set. However, a few questions still linger. From the team's health to the new bench addition, here's a look at five remaining questions the Yankees face going into Opening Day. Will the Yankees ever get fully healthy? The Bombers were hit hard by the injury bug in Spring Training and will go into the opener with five key contributors on the shelf. Didi Gregorius is in the middle of Tommy John surgery rehab and CC Sabathia still needs time after his angioplasty, but New York also picked up three new injuries in the spring: Luis Severino and Dellin Betances are each out with shoulder injuries, while Aaron Hicks' back continues to act up. On their face, some of these are minor injuries, but the recovery is going slowly. Hicks was initially expected to return to begin the season, but his injury has lingered. Severino is out until at least May and, with Betances, there's no such thing as a minor shoulder issue. The Yankees can survive any one injury on its own for now. Still, losing 40 percent of your rotation, your newly extended center fielder and an ace reliever puts pressure on those who made it through healthy. The injuries have already affected roster choices with the acquisition of Mike Tauchman and Domingo German claiming a rotation spot. Now the team needs to get healthy to shore up their holes. Can New York rely on its depth starters? With multiple injuries in the rotation, there were openings this spring and German claimed the first one, as he was named the team's No. 4 starter. In some seasons, the team wouldn't need a fifth starter until mid-April, but their schedule shakes out that they'll need to use the No. 5 man twice before April 11. On its face, the rotation was upgraded this offseason with James Paxton joining the fold while Sabathia and J.A. Happ re-signed. Every team needs to turn to its depth at some point, but the Yankees may need it more than most: Sabathia won't be back until mid-April at the soonest. That could mean more than a handful of starts for German and either Luis Cessa or Jonathan Loaisiga before the starters return to their regularly scheduled programming. German and Cessa had strong Grapefruit Leagues, but neither has held down a Major League role in recent seasons despite some opportunity. It's make-or-break for Cessa, who is out of options. Gio Gonzalez waits in Triple-A with an opt-out date of April 20, so he can provide a stopgap if the younger options can't hack it. Still, the depth will be tested from the get-go this year. Can Troy Tulowitzki hold up? 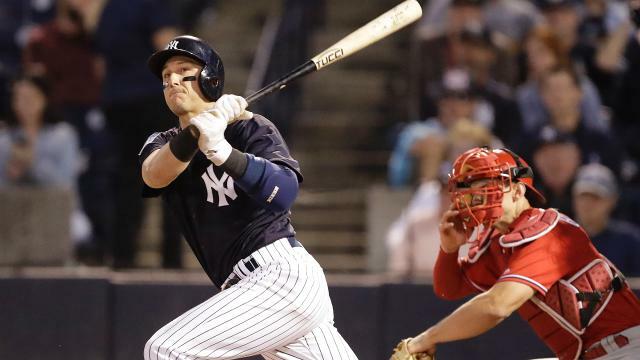 Even after a healthy and productive Spring Training, Tulowitzki is still the toughest Yankee to project. He did just miss an entire season after all. He's a "great if healthy" player with the "if" being a key phrase. Aaron Boone has stated a desire to give him regular days off with Gleyber Torres shifted over to shortstop, but can Tulo stay on the field and produce in even a lessened workload? Even with his immense talent, the veteran hasn't been able to do so for multiple seasons, and he needs to prove himself once again. How will the first-base job shake out? Hicks' injury gave the Yankees a reprieve on deciding which first baseman to bring north from Tampa, but the Luke Voit vs. Greg Bird debate is still alive. Alhough both could grace the Opening Day lineup card, Voit likely earned the starting first base job to begin the season, particularly after another health scare for Bird. However, Bird hit well in his first healthy spring since 2017. If you remember that year, he dominated Grapefruit League competition before a late spring foul ball off his foot led to an injury-plagued season before a flourish in October. His bat looks back to normal, though regular season competition has yet to judge that. Voit hasn't lost the job, either. He posted a similar line to Bird this spring with fewer walks but more homers and could very well repeat some of his 2018 breakout. While Voit may get the job to start by default, March and April give each an extended audition to get the job long-term. Tyler Wade appeared all set to make the roster as a utility backup, but the acquisition of Tauchman just before camp ended sent Wade to the Minos. So, who is this Rockies outfielder-turned-bench bat? The 28-year-old has been a high-average hitter with a good eye in the Minor Leagues since he was drafted out of Bradley in 2013. He made his MLB debut at 26 but has just 69 plate appearances in a Rockies uniform. He makes sense for the Yankees in multiple ways. He can play all three outfield positions with some proficiency. Brett Gardner has been prone to breaking down late in seasons and the team, therefore, would want a competent center fielder to give him a spell if Hicks is out for a long time. Even though he may not get an extended opportunity in the Bronx -- the likely outcome considering who's in front of him -- Tauchman simply provides needed depth without a high cost. The Yanks were dealing from a position of strength with Phillip Diehl yet another strong bullpen arm. However, there's the potential he's a diamond in the rough as Tauchman has yet to get a real look at big league playing time. He displayed newly discovered in-game power with 36 homers in Triple-A over the last two seasons.